Our trip started with difficulties or let us say as Vassula’s husband said “the odyssey”. It started in Athens where Vassula’s flight arrived late from Rhodes alarming us in case we lost our flight to RIGA. At check-in point we were last in the row and we could see how the ground hostess started to panic for lack of time. We finally arrived in the front and suddenly she told us that she cannot give us our boarding pass because apparently the luggage we had to check in had an extra charge and it was not paid. The travel agent did not see that an extra charge had to be paid for the luggage. The running and stress started once more, because she said we had to go to an office opposite to pay the extra charge. We were close to departure time and here we were, delayed far from the gate. To top it all, our gate was at the other side of the airport. Eventually we made it, but only after a lot of stress. 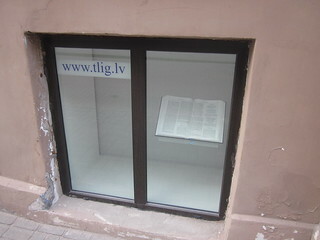 It encouraged us when we saw another amazing surprise - a window where a TLIG book was prominently displayed and kept open allowing passers-by to read it. 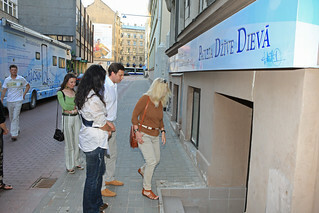 The messages are literally on display in Riga! Our day began with a TV Interview for one of the leading non-Christian state channels. The interviewer started to interview Vassula, not hiding his incredulity about her mission. As Vassula gradually answered in a clear and direct manner, the interviewer started to change and became more interested, while the doubts that had been in him previously, and which had made him defensive, dissipated. In the end he was moved by Vassula's answers. After the interview was over and while we were heading out he met his father who was the owner of the TV channel and said, “You really missed something. I wish you would have been with us to hear the interview.” He asked where Vassula was giving her talk and decided to come to the clergy meeting in the afternoon to hear more. In that meeting many clergy from different Churches came to listen to Vassula’s witness. One could not help noticing how interested they were, giving Vassula full attention especially when she spoke of how the Lord wants Unity in diversity. At the end Vassula took questions and the priests were glad of the opportunity to ask Vassula questions to clarify the themes she presented in her talk. The TV interviewer who had also come to listen said at the end of the meeting, "I've had 'goose bumps' all through Vassula’s talk and I felt that something beautiful was passing through (enveloping) my soul”, and his attitude changed completely from the skeptical and ‘scientific’ view he had prior to Vassula’s interview. He was truly touched by every word pronounced by Vassula. 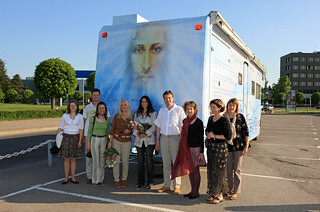 The organizers had placed in the city’s plaza a large screen directly linked to the meeting hall, so Vassula would be seen and heard speaking about the love of Christ and what Christ says to all of us. Her witness was heard not only inside the meeting hall but also outside in the city centre. This somehow reminded me of John the Baptist who was crying out and calling for repentance, as this was one of the major themes. And we continued our “odyssey” knowing that the TLIG prayer group had started to pray to God for help. On our arrival at Helsinki, Rev. Nicklas was waiting for us. 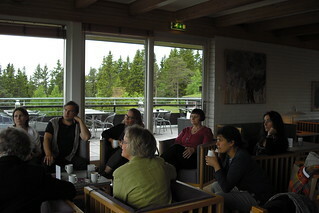 It was the first time that Vassula had witnessed in Finland. We were happy that the weather was beautiful and the sun shining. Rev. Nicklas greeted us warmly and drove us to our hotel. In the evening Rev. Nicklas proposed that we go to Munkkivuori Church and listen to Mrs.Ulla-Cristina Sjoblom leading the service and pray together with the assembly. The next day we were invited for lunch with a Vicar so that he could meet Vassula whom he knew about from others. Vassula shared some of her mission with him. He was happy and said that he would come to the public meeting to hear her witness - and so he did. 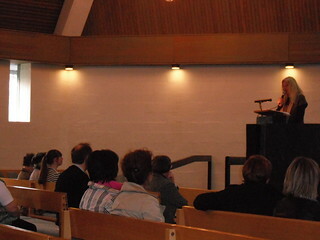 The meeting started in the afternoon in the Lutheran church. Rev. Nicklas introduced Vassula. She spoke of the importance of repentance, the importance of the gift of love and the Holy Spirit the giver of life, and the calling of the Holy Spirit to the churches for unity. She emphasized the intimacy that one should have with Christ, never forgetting however that God is holy and that one should also practice the fear of the Lord, which is the beginning of Wisdom. At the end of her speech, people were moved. Seeing the enthusiasm and the emotion of their faces, Vassula agreed again to answer some of their questions. Everybody was so touched and so eager to start reading the messages, that all the books (the one-volume) were gone. The seed now was planted in Finland and the Lord will do the rest. This should be a lesson for us to trust God and His plan of salvation. He is in control of everything - and no one else. We should not forget his words. 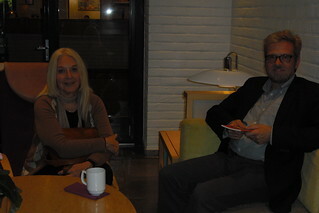 Samuel Cavallin and Solveig Rannestad, two of the organizers, welcomed us at the airport and drove us to the hotel where we took a quick dinner together, because Vassula had a meeting with Joachim F. Grün a Protestant theologian and a retreat leader. Do you come with a special message for Norway? 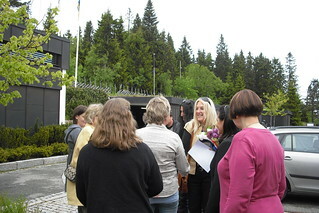 When I was invited to Norway, I saw that it was the will of God. I go where God sends me. I become his echo and repeat what He says. He wants that all people approached Him and start understanding that God is much nearer than they think, and that He calls them to repentance, so that through this act of humility His Holy Spirit can renew them and aflame them with His divine Fire to become fervent apostles of these end of times. Vassula is concerned that all churches should agree on the time for celebrating Easter. She says that it is a big scandal that we don't celebrate the Crucifixion and Resurrection together. Is not that a minor question, compared to a common Eucharist? A common Eucharist should be the result of our total unity in diversity and this is the goal that Christ desires. But Christ is asking us to begin with something that is not so difficult, to show our good will. If I am critical to the message, am I then sinning against the Spirit? No. But if you see the fruits of the message, if you see Gods action and Gods grace, and then still say this is not from God, but from the Evil One, then that is sin against The Holy Spirit. This was what Jesus called sin against the Spirit: "They saw his miracles and good deeds, and they said they were performed with the power of Beelzebub." Vassula then, as soon as we finished our lunch, had another Christian newspaper interview waiting for her with journalist Johannes Reindal from newspaper Dagen. 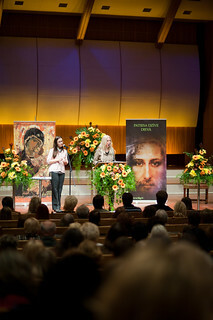 One of Rydén’s working fields is her effort to unite the big Churches - the Catholic, the Orthodox and the Protestant. This is one of the most important tasks Jesus has given her in his messages. Her hope is that they next year will agree on one date for their Easter celebration. That may be a step forwards, but beyond that she can see few signs of rapprochement. Many people work with humility and sincerity to realize such a unity, and others resist. Unity is important because the Church has been weakened and the faithful turn their back on her. A split kingdom falls apart. There is much fear, pride and self-interest between churches. 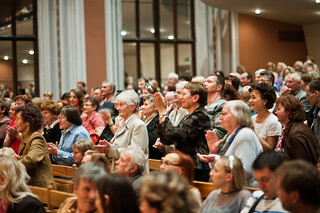 In the evening, the public meeting began with same call from God for all the country - “the importance of repentance”. We were welcomed by Vassula's two sons at the airport. Stockholm was our rest time until going to Gothenburg on the 29th. On the way to the airport we met Karin Wiking who had arranged for Vassula to meet Bishop Anders Arborelius at St. Eugenia Church. Vassula and the Bishop along with Karin, went to a private room where the Bishop heard about the progress of Vassula’s mission for Unity and the accompanying problems that follow this mission. As always he was very understanding and thanked Vassula for her concerns about Unity and for her sharing. 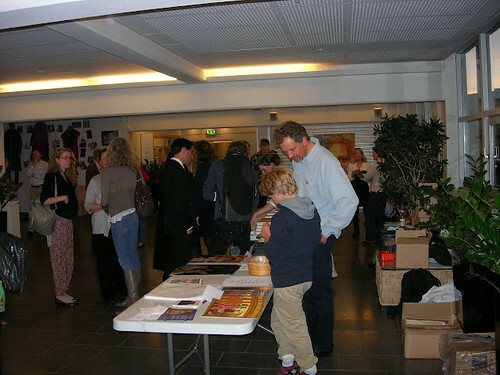 At the airport, we were met by Bo Westergaard and Ulf Åberg and taken by car to the hotel in Gothenburg center. One hour of rest was quite sufficient for Vassula to proceed directly to the public meeting which started with beautiful songs and ended with Joy on every face. 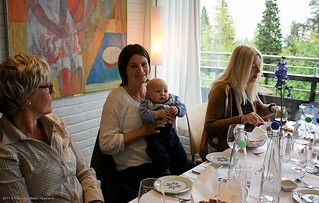 We took dinner together with 30 people from the TLIG prayer group. I was really touched by the peaceful smiles on the faces of everyone here. Not far from the Volcano - but who cares, "who has the Lord Jesus with him, who can be against him" as St.Paul said. 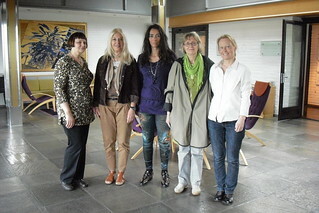 We were received by Erla Maria Simonsen and Arni Brekku. Their first words were: " You are blessed that we have the sun today. In the Faroe Island we have the sun 50 days out of 365 days, and it’s not guaranteed!" 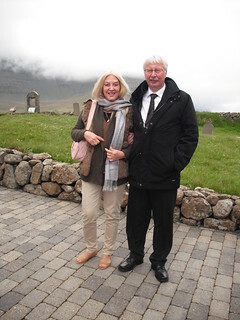 Also, Bishop Jógvan welcomed us very warmly in his house and he was so eager to have Vassula come to the Faroe Islands that he had helped Erla with the arrangements to bring Vassula. 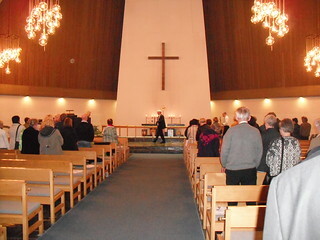 He announced Vassula's visit in the newspaper: In NORÐLÝSIÐ newspaper on Thursday 26 May 2011, Bishop Jógvan Fríðriksson said that the Lutheran Church acknowledges the gift of prophecy as well as other gifts mentioned in Holy Scripture and that the Church also respects other creeds. 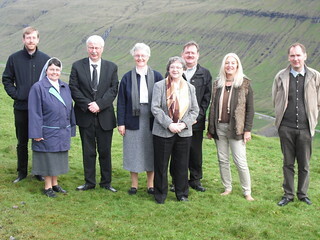 With the invitation from Bishop Jogvan Frioriksson, the only Faroese Lutheran Bishop on the Faroe Island, we departed at 9:30 for Viðareiði, a village located in the northeastern part of the country which was 1½ hours drive away in the northeastern part of the countr. There we discovered the amazing nature that God created in this region. 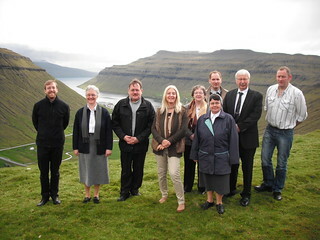 We stopped at the highest point on Faroe Island. 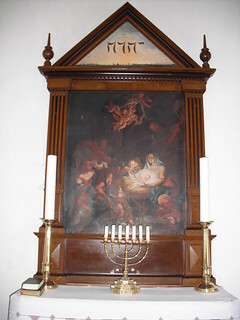 A painting of St Mary in the middle of the Altar. After lunch, Bishop Jógvan invited us to coffee in his home. How nice it was to see his warm reception of us. We returned to Tórshavn for some rest in the hotel before the public meeting in Vesturkirkjan in the same church where Vassula spoke in 2004. The meeting started with the Parish Priest of Vesturkirkjan giving the reading of the day. 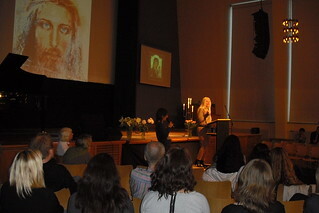 This was followed by Vassula’s talk transmitting God’s message with fervency and zeal. At the end of the meeting Bishop Jógvan said:"I have never felt such a Peace before". He had invited some of the clergy who had been with us and lunched with us on this trip to the meeting to hear Vassula for the first time. At first they did not know what to expect as they had no idea who exactly Vassula was and did not know about her locutions from the Lord. After hearing her, they thanked the Bishop wholeheartedly for having brought them to hear Vassula as they were rather impressed by her talk and were touched as well. Here we are in Copenhagen, in the last country on our long apostolic trip. We went to Mass and straight after to the hotel. Thursday, 2nd June started with an interview at the conference room in the hotel with Tina VARDE from Udfodaingen newspaper. Tina wanted to know Vassula’s thoughts on people who are far from God and how they can come back to Him and put Him in their daily life. Vassula explained that evangelizing is necessary. But so long as there is this comfort and satisfaction, so long as people become self centered and selfish, the indifference to God grows wider. However, the soul has been created to live in God, so when the soul abandons God, it wants to fill the space with material things that wear away. That is why people are never quite happy and keep buying and buying things, replacing always material things with new things. The soul needs God but they do not even know it. So evangelizing is important to tell them that God is not far, but near them all the time. They have to be re-educated and reminded from where they come. All those material things can’t give satisfaction, that’s why we have become fastidious, as God said in the messages. For this reason many who do not have God in their life have lost the values of life. Another interview in the afternoon was with Nanna Schelde from Kristelight Dagblad. The interviewer was curious to understand the meaning of apostasy. Vassula explained that it is when Christians voluntarily reject the divine Truth. These people become apostates. These sorts of people are at war with God. “No, I was not purposely and knowingly rejecting God, I was simply aloof from God and did not know Him. Out there, in the world there are many good people who do not know God so they do not know how to approach Him, and I was one of them. This is why I do not judge them. However, God always gives a chance. We should open our heart wide open and receive Jesus Christ. God always is near us and will keep knocking on the door of our heart to receive Him. He is our Father and we are His children whom He loves and will keep giving us always chances”. “Yes, it is a gift. What God tells me is with the intention that I become His echo and pass on His Word to the people. Many people have been touched and changed their life because God’s Word has power, it can open people’s eyes and let them say I want to know more. There is nothing new in the messages, they are a reminder of the scriptures. Vassula ended the interviews explaining that unity will be a spiritual unity in diversity; that each church has a lot of riches that they could share together and be one, reconciled and united. We have one faith, one baptism and one Christ. The last question was: "Why you?" “Because I am like everybody, housewife, with children, not a nun, and nothing special. Consider me as a secret agent of God. When one sees me they can never guess, for all I have as knowledge from God I carry within me”. That evening we had the public meeting and as usual, we saw the faces absorbed in Vassula’s talks, reflecting peace and joy. 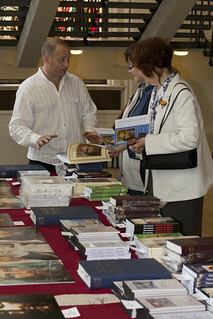 As soon as the meeting finished, people ran to buy the TLIG books to know more. Finally there was a last interview with Mikael Laursen KKR, Christian TV channel. And Vassula’s mission was accomplished for Scandinavia and so the "odyssey".